Any body who has been listening to hip-hop in the past two or three years should know who Meek Mill is by now. The latest Philly product has been burning up the streets with mix tapes and appearances on the various Maybach Music Group releases often bringing and energy and character that out shined whomever happened to be on the track with him. 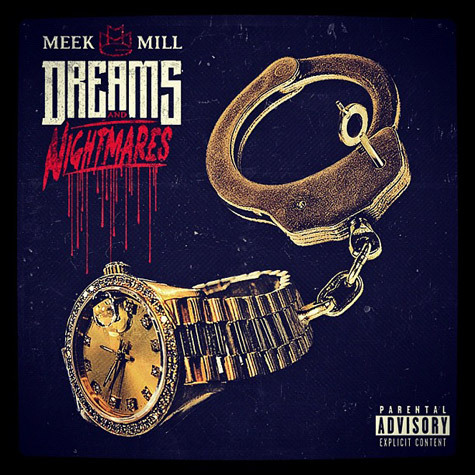 Finally, after all of that groundwork, Meek's debut album, Dreams and Nightmares has been released. The album starts with "Dreams and Nightmares" which starts with a simple piano riff as Meek Mill spits his normal come up raps until it switches to a more aggressive beat and Meek goes and tells you how he is balling on everyone now. The album then goes into "In God We Trust" which is pretty much about getting the money and what happens over the paper chase. "Young and Gettin" it features Kirko Bangz but it could have easily been Future on the track with the sound. Meant for strip clubs this song isn't saying much. "Traumatized" is a more emotional song as Meek just talks about the things that happened in the city to put him in this position and give him his mentality such as his vow to get the man who killed his father. The tone changes as Rick Ross makes his first appearance on "Believe It". Unfortunately this song sounds like a bunch of other joints from mix tapes in the past couple of years. The single would be "Amen" with Drake and has been both on the MMG compilation album and other mix releases in the past four months. John Legend, Nas, and Ross all show up on "Maybach Curtains" which is like a new incarnation of the mafia music set that have been on each Rick Ross album. It's cool for them to just be rapping but Ross is getting boring by now since he never brings a new approach to a verse. Wale and Trey Songz join Ross and Meek on "Lay Up" for the ladies encouraging them to lay up (as in lay in the bed) with the crew. The odd part is you go from something smooth for the ladies to a story from Meek Mill "Tony's Story pt.2" where he continues a fictional story of the streets from one of his previous mix tapes. This is one of those things you don't see much of in rap now so it was cool even though there was nothing original nor any twists in it. Mary J. Blige handles the hook on "Who You're Around" where Meek raps about the friends who are really enemies. "Polo and Shell Tops" is the motivation behind the hustling of Meek and guys like him. Not a bad song, but it is repetitive with everything else he has already presented on the album. Louie V sings on "Rich and Famous" another song for the females that could have stayed on a mix tape. The album ends on a hood note with "Real Niggas Come First" and it's just another song, not a strong track to end off the album. Look Meek is what I expected. I think his energy has had him put on a pedestal, especially because he stands out on tracks with Ross or Wale. But this album seems like over exposure especially following up on all the mix tapes and features. The album sounds like it runs out of steam and Meek has limited ideas and lyrical ability and it gets magnified by the repetitiveness on the album. There are some decent songs early on but eventually it all just runs together.